If you are looking to trade in options I would suggest you should trade in Nifty or any other index option only like the Bank Nifty. Highly liquid means you will find people to buy or sell at the price you want. If there are no people willing to buy what you sell, or sell what you want to buy, you will never be able to trade at the price you want. What happens in a less-liquid stock is that you rarely get people who want to buy at a price that you want to sell and vice-versa. For example if you want to sell an option for 100, there might be some one willing to buy at 95 only. So if you have opened a market order to sell, even though the price of the option you might be seeing at 100, will actually sell at 95. Remember that the exchange house doesn’t pay you for the option that you want to sell, its some person willing to buy that option will pay you. If you want to sell it at 100 only, they may not be willing to buy at that price. You will have only two options then, either sell it at 95 or wait till someone is willing to buy it at 100. This problem would never have occurred if the stock, or the exchange were with full of people who want to trade. Even then you may not get the exact rate but it will be very close and if you are willing to wait a little you should get the exact rate that you want. Suppose Nifty ATM (At The Money) Call is currently at 72.15 and you want to buy it at the market price. You will get it at 72.15 or at most 72.30. However in a less-liquid stock you may not get the option at the price you want. I have seen huge difference. Once in a mid-cap stock I was willing to buy a call at 1.00 when the price of that option was at 1.20, however there was only one seller who was willing to sell at 2.00. If I would have hit market (and not limit) while buying the option by mistake I would have got that highly priced option for 2.00. Unfortunately I would have then sold it for a loss. It also means that sometimes even if you are making a profit, you may not be able to realize it at that price if there are no one willing to buy at the price you want to sell. 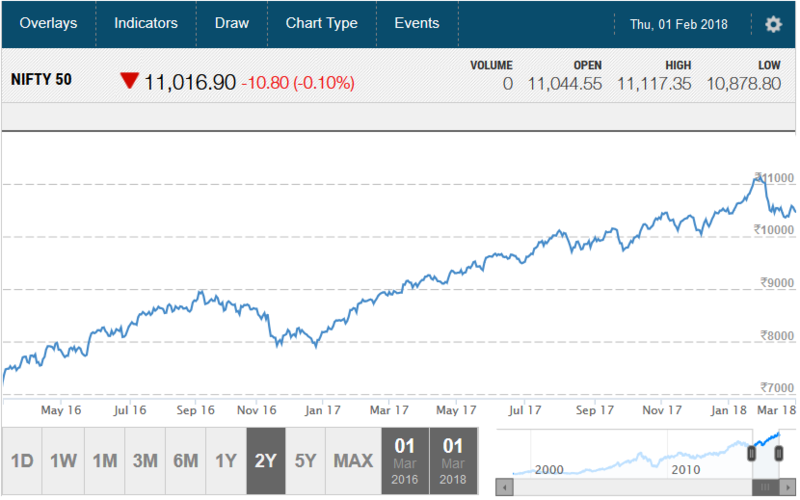 Your assumption was right, the stock moved in that direction, but still you will not be able to make a good profit out of it – because there are no buyers. But in Nifty you will never have to bother about liquidity. You will always get the buy or sell price you want even for the next month series. Compared to stock options, margin required to short on lot options in Nifty or Bank Nifty is almost 40% less. For some stocks margin required to short an option or trade futures exceeds Rs.1 Lakh. This is a big amount to trade for many retail traders. There is a formula to calculate margins but I will not get into the details of it as I just want to say that in Nifty futures or option selling your margin blocked will be much less. 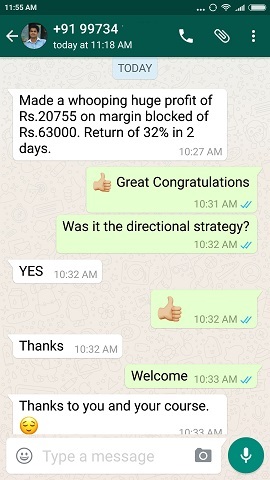 Since margin blocked is much less you can trade in more lots if you are absolutely sure about the direction of Nifty – and make more money too. Unlike stocks nifty will not swing too much in a day or even the next day. Which means you will get enough time to exit the position if its going against you without loosing too much cash. Ideally you should put a stop-loss in the system, but what if it opens gap up/down against your position? For that you must learn hedging. On Apr 12, 2013 Infosys fell almost 21%, but on that day Nifty fell just 1.17%. Imagine someone who bought Infosys futures or sold an ATM put without any hedging – he would have lost his entire margin. Lets do some calculations. On Apr 11, 2013 Infosys closed at 2917. On the next day it closed at 2295. One lot of Infosys was 125 shares in Apr 2013. If somebody would have bought one lot of Infy at 2917 and sold at 2295 his losses = (2295-2917) * 125 = -2,33,250. A loss of more than 2 lacs in one lot. He would have got a margin call from his broker. Most retailers would have bought thinking that Infy will rise after the results. Yes some were lucky to have sold it and made a windfall of cash. But how many times does that happens to us? Therefore we must hedge our position. It may cost something but it will ensure you stay in the market and do not lose your home. Yes some people have lost so much – that money can buy a 2 BHK flat in many cities in India even in 2018. Had someone bought Nifty Future his losses would have been small and bearable. 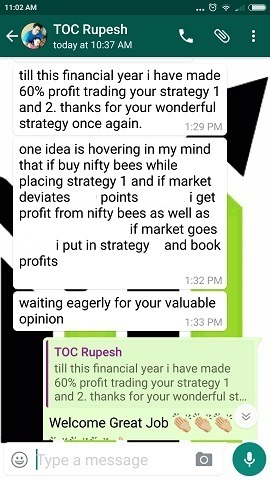 Therefore I strongly suggest one should trade options/futures in Nifty/Bank Nifty but with proper hedging. These are some of the reasons why I think retailers should trade in Nifty only. What You Can Do If You Are Losing Money Trading Speculative Options or Taking Tips and Losing Money? You can do my conservative option course. 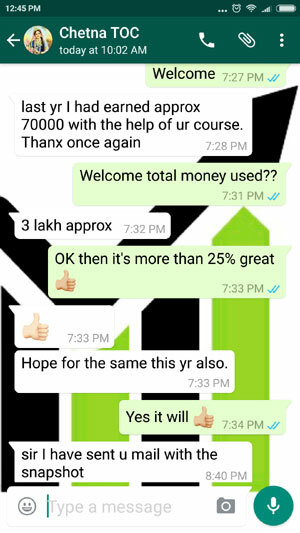 You will learn proper hedging methods, risk management, adjustments and 5 strategies and a bonus trade to make 2-3% per month easily without any speculations or worrying about the direction of Nifty. You need not leave your job for that. Your options will make money for you while you work in your office. Contact me to know more. 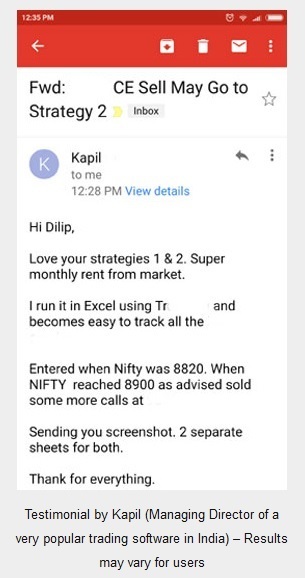 Manohar… Trading is a risk, there is no ZERO risk nifty option hedging strategy. But you can always take a limited loss strategy. For me non-directional strategies have always worked best. Agreed I never make amazing returns every month – but I do make 3% or more with them. If you can compound your money at 3% per month – even if the money is small – it will grow into a huge amount in a few years. Therefore you should always divide your financial assets. Some money every month should come into trading account, some should go to a fixed deposit in banks, some can be invested in mutual funds etc. That way if your trading account gets a huge hit on some day, you will still have enough cash to live peacefully. Till now i was reading Ur posts in a piece meal fashion. Today onward i will go through them in the chronological order they were written. So i will get a comprehensive knowledge about Options trading though some of the posts i may be rereading. If i am not wrong the First post was titled ‘ What are Nifty options ? ‘ with date line May 24, 2013. As these posts started nearly 3 years back, obviously some information, details etc. have become outdated. Do you have any plans to revamp the information in your posts so as to make them contemporary ? You have mentioned in one of your recent posts U intend to make appropriate changes in your posts before U split your current course into two courses w.e.f. 1st April 2016. If u have no objection i am willing to help you voluntarily in revamping of these posts as per your directions. After reading this post some of die hard option traders will switch over to Nifty Options trading only without an iota of doubt IMHO. ‘ If you can compound your money at 3% per month – …. ‘. Yes sure Sir, please re-write anything you want and let me know via email or comment mode and I will do the changes. I have for now postponed the idea of splitting as I got lots of emails not to do from my would be customers. However all posts may need a rewrite anyway, so please read and let me know anything you might like to add/edit and I will do. Previous post: What are Nifty Options?